My 4-month-old baby boy is suffering from Luekocyte Adhesion Defect, a rare immuno-defeciency disease. He was diagnosed when he was just a month old. 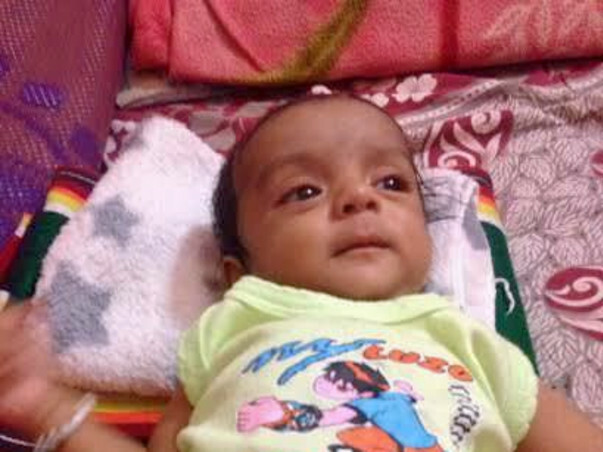 My wife, Shilpa and I were devasted to hear that our new born baby is suffering from a rare disease. With great difficulty, we treated him till now. We have an got an opportunity to cure him but we need help to do this. As parents we went through a difficult time when we lost our first child at three months. Our world came to end. We didn't get a chance to be our child for long. This baby came as a blessing. We were overjoyed but now we are on the verge of losing him as well if we cannot continue his treatment. He has been on treatment since the first month of his birth. 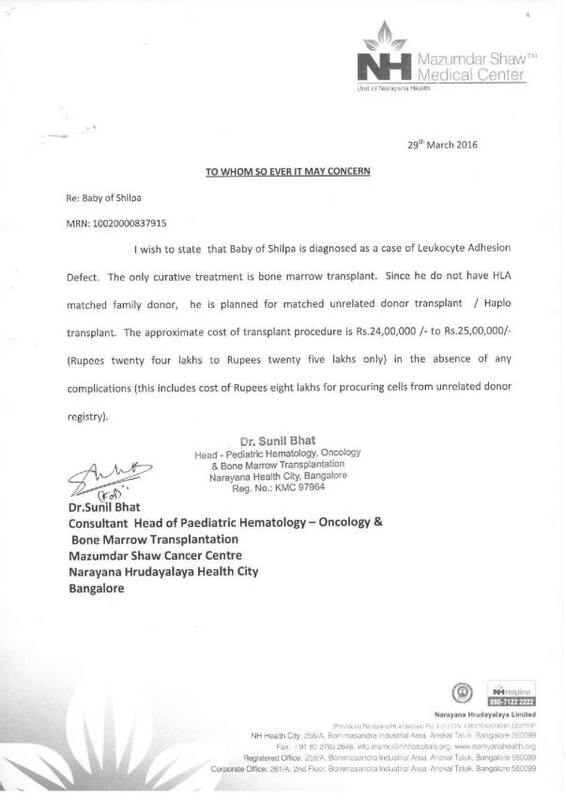 He is undergoing treatment at Narayana Hrudalaya, Mazumdar Shaw Medical Center, Bangalore. Since he is suffering from a rare condition, doctors have suggested a bone marrow transplant as a permanent cure. 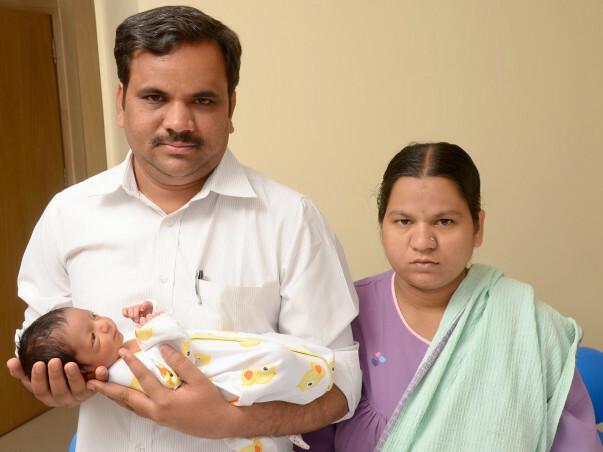 The estimation given for the transplant is 23-25 lakhs which included the charges for the donor. Since both of us are not a macth for him, doctors need to find a unrelated donor. We are really worried for our son since he is really small but in order to save his life, this is the only option. My father is a farmer and he sold a small piece of land he had to help us. Now we are helpless. We have lost a child once, now we don't want to lose him. But 25 lakhs is a huge amount we have to arrange. Your support will help our baby stay alive. The baby boy has not been named yet. He will be named in a couple of months. He has been asked to come for next check-up on 5th October. Let us pray that he continues to sustain this improvement in his health for weeks to come. We will keep you updated about the progress of treatment. I am Sudhakar, a Milaap Open fellow in Bengaluru. I spoke with Kariyappa on 24th August. The bone marrow transplant was carried out on 5th July, post which the baby has recovered well. Unfortunately, he has not been discharged from the hospital yet. However, he has been suffering from loose motions since the beginning of August. He is currently under observation and treatment. The blood counts till the end of last month were not yet normal. Further blood tests will be possible only once he recovers from loose motions. Dr. Sunil Bhatt will be able to recommend further course of treatment once the blood test reports are available. The baby was born on the 1st day of this year and his parents have been immensely worried since then. “I am very thankful to the support shown by all the contributors for my son. I request all of you to pray for him for a speedy recovery,” Kariyappa says. Here's an update on the baby's treatment. We are happy to inform you that the baby underwent the transplant successfully and is recovering. The family is still in the hospital. There will be several tests in the coming days to see if his blood counts are improving. Kariyappa has shared his gratitude and has informed us that the baby is keeping well.